The diSPIM uses ASI's modular controller, the TG-1000 or “Tiger” controller. It has separate cards for controlling the XY stage, linear stages, micro-mirrors (scanners), triggering cameras/lasers, driving piezo objective movers if present, driving filterwheels if present, etc. In general firmware updates add new functionality and fix bugs while retaining backwards compatibility, though on rare occasion backward compatibility is compromised. If you are not using Micro-Manager, you should double-check with the vendor of the acquisition software before updating firmware. If you are using Micro-Manager, you should generally download the latest nightly build whenever you update firmware. Conversely, if you are having problems with a recent build of Micro-Manager make sure that the controller firmware is the latest. Updating the firmware will erase all (or very nearly all) the firmware settings, including the positions of motorized axes, software-defined limits, axis speeds, etc. Move motorized stages to their zero position if feasible, or at least to a known position so the zero position can be easily recovered. Turrets and filter sliders, if any, should be moved to their first position. If you have made adjustments to firmware settings outside of the diSPIM plugin it is advisable to note them down so that you can set them again afterwards. This is not necessary for settings controlled by the diSPIM plugin. To update the firmware you need the ASI Tiger Console software and the latest diSPIM firmware package from ASI (last updated 2019-01-01, firmware version 3.23), or from the diSPIM firmware archive. Use 7zip to decompress. This firmware should work for diSPIM systems sold 2014 or later. A link to download firmware for the oSPIM is found on the oSPIM page. General instructions for using the ASI Tiger Console software for updating the firmware are here. Standard firmwares for card addresses on diSPIM controllers are as follows. Omit any cards that your controller doesn't have. If your controller is otherwise non-standard (e.g. 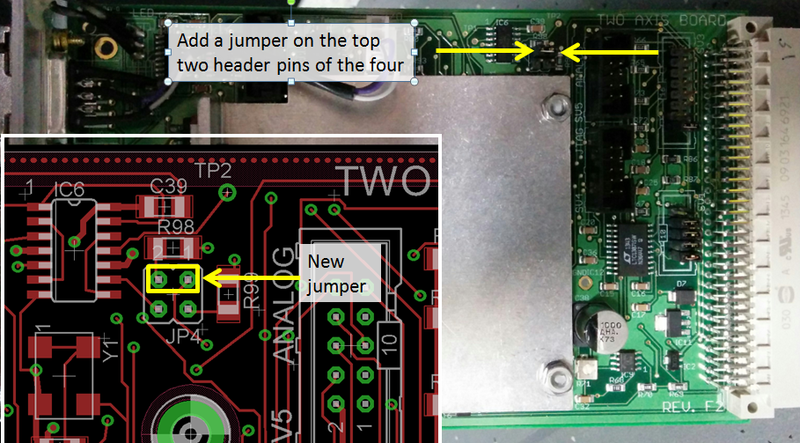 the addresses don't match the labels on the front of the controller) feel free to contact ASI for help. In general you should update all the firmware on your controller together. One exception is filter wheel firmware which generally does not need updating. If you have any trouble please contact ASI. In late 2016 ASI transitioned to using scan-optimized XY stages with SPIM systems by default. These stages have 16 TPI leadscrews instead of the usual 4 TPI leadscrew, along with removing anti-backlash gearing in the X axis for smoother scanning. As of firmware version 3.20 (June 2018) there are two firmware versions available for the XY card and you should use the one that matches your stage. Use SCAN_XY_LED_SO__Adr1.hex for scan-optimized 16 TPI stages (note the “SO”) or SCAN_XY_LED__Adr1.hex for 4 TPI stages. Using firmware prior to v3.20, after flashing the XY card firmware you need to set the leadscrew pitch using a serial command if you have a scan-optimized stage. That way the controller knows that the leadscrew pitch is 16 TPI and can report distances accordingly. Unless told otherwise the firmware assumes 4 TPI leadscrew. If you are upgrading from pre-3.00 firmware then the piezo range(s) may need to be set to match the hardware using the PR command. Starting with firmware version 3.00 the piezo range is stored in a way not affected by firmware updates. Afterwards power cycle the controller and verify the setting took effect. You can see the current range in Micro-Manager with the read-only property “PiezoTravelRange(um)”, or send PR <axis letter>? and look at the reply code. Common range codes are 3 for 150um, 4 for 200um, and 5 for 300um piezo range. The Programmable Logic Card (PLC) is a ﬁeld-programmable card for digital logic, sort of a mini-FPGA inside the Tiger controller. Its original use is to enable multi-laser control for diSPIM, but it is designed to be very ﬂexible. You can find full documentation of the PLC on the ASI website. 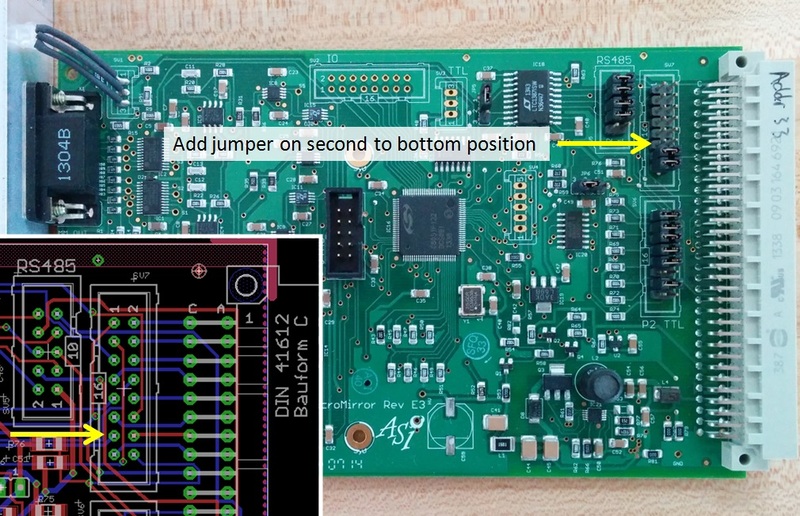 When used for diSPIM under Micro-Manager, the PLC uses a clock signal from the micro-mirror card so that the camera and laser triggers are tightly synchronized with the sheet generation. 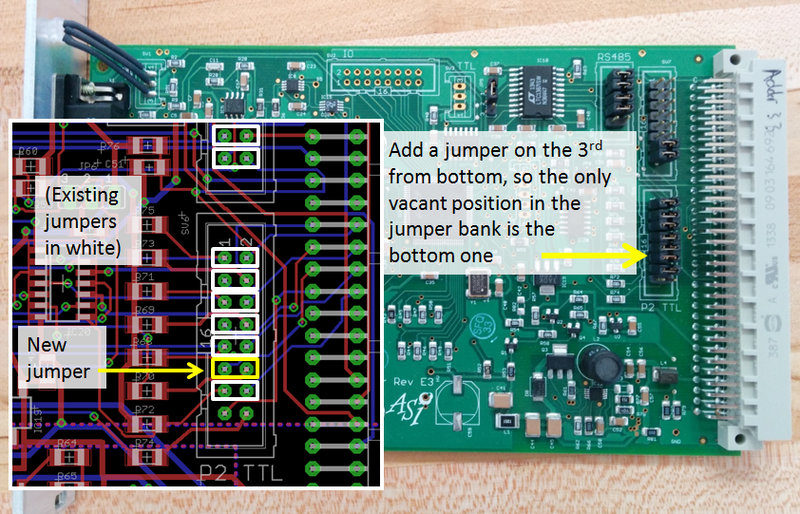 For Tiger controllers sold with the PLC this is already done, but when the PLC is added to an existing controller a jumper must be added to the micro-mirror card as shown in this photo. Instead of moving the sheet position and imaging piezo to create a stack of images, the sample can be translated through a fixed sheet. Generally speaking this is best for large and/or flat samples. The main advantages of stage scanning are that the light sheet can be thinner for flat samples because the beam waist stays at the same height relative to the coverslip and that there is a nearly unlimited stack “Z” (instead of limitation of piezo range). The main disadvantages are that the output data need to be deskewed or sheared before conventional analysis and the minimum time between successive time points is somewhat longer (because the motorized stage can't return to its starting position as fast as a piezo stage). In the usual implementation, the stage moves continuously in the X axis at an appropriate rate to give the user-specified slice spacing. The speed of the ASI stage is very uniform and the stage's encoder triggers the acquisition internally to give extremely repeatable positioning of repeated stacks. For traditional scanned beam systems, the beam sweep creating the sheet creates a “stop motion” effect. As of June 2018 there are two firmware versions available and flash the one that matches your stage. Use SCAN_XY_LED_SO__Adr1.hex for scan-optimized 16 TPI stages (note the “SO”) or SCAN_XY_LED__Adr1.hex for 4 TPI stages. The stage cannot go arbitrarily slow and still be perfectly smooth. For 4 TPI leadscrew max speed is ~8.5mm/s and speed setting quantum is 0.000688 mm/s. A rough rule of thumb is that the slowest speed that is relatively smooth is ~1000x slower than the max speed or about 12x the quantum. For 16 TPI leadscrew (“scan-optimized” stages) divide those numbers by 4. So at this 12x quantum threshold, the “minimum smooth” speed is 2 um/sec for 16 TPI and 8 um/sec for 4 TPI. As noted above the data needs to be deskewed before it can be used/viewed in a conventional way. On-the-fly deskewing for visualizing test acquisitions and also for post-processing real acquisitions is in the plugin as of December 2016; the algorithm is fundamentally the same as the ImageJ macro but hopefully easier to use because the metadata provides most parameters (but background correction must be performed separately). Unfortunately deskewing can blow up the size of (uncompressed) data files because a lot of empty space is added. It would be highly desirable for analysis and viewing software to be able to handle the deskew operation in memory and on the fly. To date the only software known with this capability is FIJI's Big Data Viewer. Lobby your favorite software provider for this and make life better for everyone (many light sheet microscopes including lattice light sheet also require the same deskew step). The spacing between slices is specified in the plugin, so the stage moves sqrt(2) times that distance per slice for 45 degree geometry (the actual angle can be set as of March 2018). There may be very small rounding errors (which would come out in normal post-processing) but the metadata should contain the actual slice spacing instead of the user-specified one. Rounding errors were reduced as of the 2018-03-15 nightly build. The initial X position is used as the center X position of the dataset and the stage should return there afterwards. For large samples there is a YZ grid creator (as of March 2018) so multiple strips can be collected covering a sample. The same GUI allows you to create a “grid” in X where instead of specifying slice spacing you specify start, stop, and number of slices. There are three modes implemented, “stage scan”, “stage scan interleaved”, and “stage scan unidirectional”; see the manual's description of the different SPIM acquisition modes.